Hey there, ski patrol! 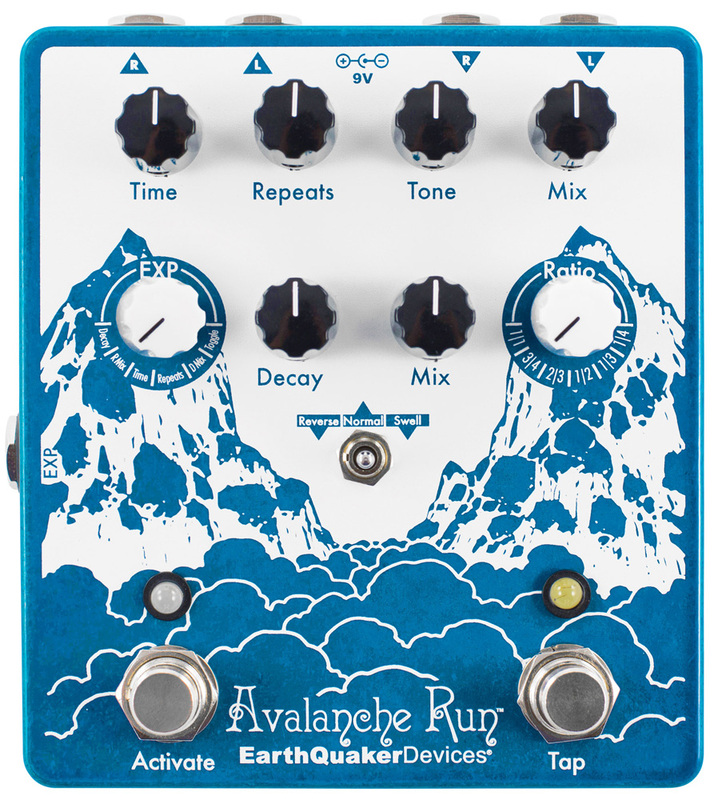 The Avalanche Run is a double-black diamond Delay and Reverb Device designed to lift your skinny fists to like antennas to heaven and conquer the dark tundra of your mind. It is the product of years of hard research and development time, during which we conjured up our very own magical proprietary DSP platform and engineered new advancements in human-cyborg relations to bring you the very best ambient exploratorium machine our future-selves could pre-imagine, given the constraints of time-space manipulation and inter-dimensional space travel. At the crest, you'll notice right away that the Avalanche Run is the first EarthQuaker Device to offer true stereo input/output and tap tempo, in addition to expansive expression possibilities. At the foothills, you'll discover Normal/Reverse/Swell delay modes, trails and true bypass switching; infinite repeats, sound-on-sound, controllable self-oscillation, ambient pads and drones; pseudo-looping capabilities, assignable expression control for every single parameter, tap-tempo subdivisions, and so much more. Much like the Dispatch Master, the Avalanche Run's reverb and delay are totally independent - dial back the reverb for crisp, multi-tap delays, or max out the reverb by itself for a total tonal whiteout. And since it's stereo, it's a great fit for electric pianos, drum machines, synthesizers, samplers, and studio recording. And if you think that's cool, try it on bass!